GunBroker.com is the largest online marketplace dedicated to firearms, hunting, shooting and related products. Our FFL Dealer Locator makes it easy for buyers to find an FFL holder to manage the transfer of the firearms purchase. Our Forums allow you to talk to other users about firearms issues or find out how much an item is worth. We have a Free Package of Services to help licensed dealers take advantage of the Internet. We offer tutorials in our Basic Training section to get you up to speed. We offer discounted FedEx shipping to GunBroker.com members. Get super savings AND ship & track all of your packages from one convenient website. Third party sellers list items on GunBroker.com. The Seller can choose to list the item in an Auction-style format, accepting only bids for the item, and/or list using the BuyNow! or Fixed Price option, allowing buyers to purchase the item right away at a set price. Once the item is won or purchased, the Buyer pays the Seller directly. 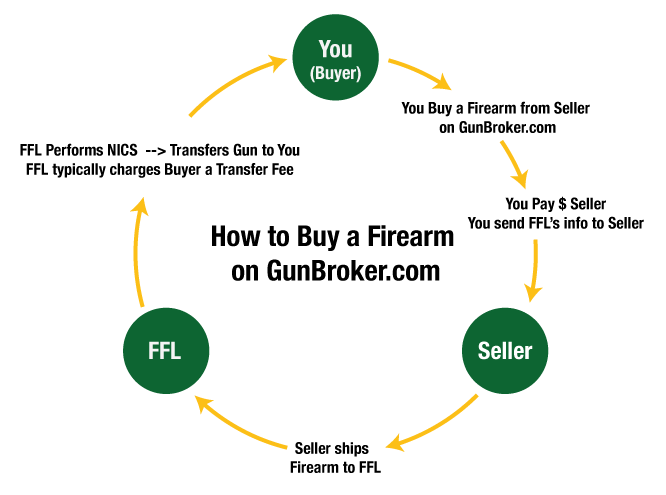 If the item requires an FFL, the Buyer finds a transfer dealer (FFL) to handle the transfer, sends the FFL information to the Seller, and the Seller ships the item to the Buyer’s FFL. GunBroker.com maintains a list of FFL Holders who are willing to manage the legal transfer of firearms to unlicensed persons. The FFL peforms NICS and then transfers the firearms to the Buyer. FFLs typically charge the Buyer a transfer fee. If the item does not require an FFL, the item is shipped directly to the Buyer. Launched in 1999, GunBroker.com is an informative, secure and safe way to buy and sell firearms, ammunition, air guns, archery equipment, knives and swords, firearms accessories and hunting/shooting gear online. GunBroker.com promotes responsible ownership of guns and firearms.